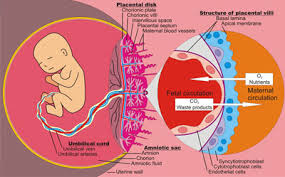 The villus is that the purposeful unit of the placenta and consists of an outer epithelial membrane layer and a stromal cell core, derived from the trophectoderm and therefore the extraembryonic mesoblast, respectively. The stromal cell core contains foetal epithelial tissue cells, mesenchymal stromal cells (MSCs), Hofbauer cells amongst others. MSCs within the human placenta are reported to be fibroblast-like cells with differentiation capabilities and immunomodulatory properties. Hofbauer cells are foetal macrophages that will be concerned within the phagocytosis of cellular trash and therefore the modulation of human placental development by enhancing villous branching. The mature human placenta is represented as having 3 main kinds of epithelial trophoblasts: cytotrophoblasts (CTBs), the syncytiotrophoblast (STB) and extravillous trophoblasts (EVTs). CTBs form one layer that lines the stromal cell core and is the supply of the refilling of the STB and EVTs. EVTs are differentiated membrane cells that migrate from the tips of the placental villi, proliferate and differentiate to make a membrane cell column. EVTs at the distal region of the column then detach from the villi and invade the interstitial compartments of the maternal female internal reproductive organ wall, thereby anchoring the foetus and transforming the female internal reproductive organ spiral artery to facilitate fetal-maternal nutrient transfer. The STB may be a multinucleated structure that covers the complete surface of the villous tree throughout maternity. It contains roughly fifty eight billion nuclei and includes a surface area of 12–14 sq. meters at term. the upkeep of a purposeful STB depends on the shedding of apoptotic nuclei and cytoplasm from the STB surface into the maternal circulation and also the continuous incorporation of latest cell elements via the fusion of CTBs from the CTB layer beneath the STB. Although placental cells are historically classified as represented above, the extent to that it's helpful to outline subtypes of trophoblast cells and stromal cells and also the relationships between cell subtypes and functions stay unclear. Single-cell RNA-seq has been a strong tool for the identification of cell subtypes in several tissues. 2 studies have examined the human placental transcriptome from later stages: Pavlicev et al. explored eighty seven single-cell transcriptomes from the human placenta at term and investigated the cell-cell interactome between the foetal trophoblast and also the maternal mucosa stromal cells; Tsang et al. studied 24000 nonmarker chosen cells from mature traditional placentas and second trimester preeclamptic placentas and re-confirmed the differentiation relationships between the 3 better-known populations, i.e., CTBs, EVTs and also the STB. each studies used placental tissues from second and trimester pregnancies, and their endpoints weren't the identification of recent populations of cells within the placenta. In the present study, we isolated human villous stromal cells (STRs), CTBs, the STB, and EVTs throughout the primary and second trimesters of gestation and monitored the transcriptome dynamics of 1567 cells at single-cell resolution. we known fourteen subtypes of placental cells and characterised their functions exploitation bioinformatics analyses and immunostaining verifications. Amongst our sudden findings is that 102 peptide hormone genes were expressed by numerous subtypes of placental cells. Our study builds a robust foundation for understanding however the human placenta develops and functions to keep up a healthy maternity.